Shiryu Music: The Ref Blows The Whistle! It's Super Futebol 2014! With the World Cup 2014 coming to a conclusion this weekend and since I have been meaning to make a tribute to Human Entertainment's SNES game Super Soccer for the past few years, I decided the time was now. It was the very first footie game to be released in 1992 along with the PAL SNES so it quickly became popular among my friends because it was a blast to play, mixing up Mode 7 visuals with arcade style football. 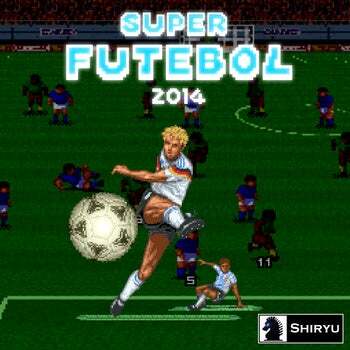 "Super Futebol 2014" is a 19 track EP that celebrates the amazing tunes found in the game. Human always made some pretty impressive tunes, in fact I thing there has never been a single football game where every team had their own theme. Sadly the series spawned several sequels that where never released in the west where FIFA and ISS ruled supreme the 16 bit generation (along with Sensible Soccer, of course). Hope you enjoy this EP while we wait to know if it's Germany or Argentina that will take the Cup home from Brazil. *OMAKE* Never heard of this game before? Here is an old episode of Shiryu & F81 Play to sort you out.